I'm not sure if this is the proper place inside the forum to post this or even if its proper to post it at all. i just thought it would be helpful to add more on the tradition of this spirit and how its used in other parts of the world, since LM sells its oil. The legend says Anima sola was a woman named "Celestine", she was a water bearer that refused to give water to Jesus during his crucifixion and gave water to the other two thieves, there for she was cursed to serve others for eternity due to her unkindness. It's a very miraculous spirit, granting a wide variety of favors to those who ask, specially when it comes to harming others. Some say that the one that works with her power, ends up alone. She's also one of those spirits who you don't want to anger or miss out on her proper payment, tormented souls have little restrain on making others suffer. The usual offering is light (candles or lamp) for a few days. You could use Lucky Mojo's Anima Sola oil for the lamp or just add it to her candles. You can either ask her to help you on your work, or just pray to her and have her do it all on her own, just be clear and remember to pay her. This is the prayer to Anima Sola. interesting. what's the color of candle you'll light for anima sola? The Anima Sola candle is red. The prayer books in spanish also advise doing a prayer to one's guardian angel right after using the anima sola. This is the first time I heard of the story of the woman who refused to give water to Jesus. All I know is that the AS was a soul waiting in purgatory (perhaps good works can help it get to heaven quicker?) . One book on Puerto Rican spiritual traditions says that the AS was used to protect houses from thieves while the occupants were away. can someone tell me if they have ever used this spell and if so, what were the circumstances and the results. I would say this is a more advanced entity and spirit to work with. Unless you really know what you are doing, personally, I would not work with this spirit, because they can be slightly demanding. I have been told if you work with her you will end up lonely, but that is up to you to decide. Also, this has already been talked about previously. The search function is a great tool to use to navigate around here. I read on the forum that if you work with anima sola that you will be alone or is it alone and lonely? Please let me know if any one knows? I find it unlikely that that 'alone' or 'alone and lonely' thing is true, because if it were I find it unlikely anyone would ever voluntarily work with that spirit. I was thinking of the same thing. But still see it posted on the forum. Asked the person that had that option. but I never got a response yet. Thank you for your response. Because people are capricious and care for results rather than consequences. "it doesn't matter if he no longer loves me as long as a i have him"
People focus more on what they want instead of what it is and what they are doing. Anima Sola conjured for love has this consequence, leaving people lonely. The Anima Sola is a tormented spirit and torments your lover back to you, so he comes back bent against their will, and not hypnotized and allured by a new found attractive you develop, its more like bringing someone into your life at gunpoint, that's why most people warn against using this sort of measures. Maybe it doesn't make sense to you because you are looking it from a non catholic perspective. Anima Sola is a spirit that originated from the Catholic belief in asking help to the departed souls trapped in purgatory, you pray for their deliverance and entrance to heave and in return they try to help you. But souls are trapped inside the purgatory for a reason, sin. So when dealing with an entrapped soul that is paying for its sins you can expect it to bring "karma" into your life. Or you can look it this way, you are summoning a tormented energy to intervene in your love life, in the long run how do you think it will affect you ? I never really thought about it that way. Thank you for giving me the insight. I know that I been looking at the forum and trying to find answers to my questions. You do make sense. Just wondering isn't purgatory is a place where god has not decided where to put you yet? Mortal sins are sins that are not forgivable? Thank you all for your replies on this post. My understanding is that mortal sins are forgivable, just more serious. All sins can be forgiven, except speaking against the Holy Spirit (Matthew 12:31-32). Yep, sorry for being unclear. All sins are forgivable, but if you die before confession/absolution of mortal sins, you go to hell. If you die before absolution of venial sins, you go to purgatory. Check wiki, search for purgatory, the article's pretty good. addressing different beliefs. 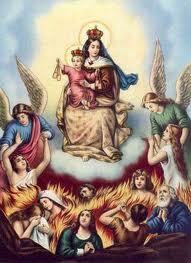 I don't know if even Catholics are in agreement on every aspect of purgatory/hell/sin/absolution, etc. Some of the more "modern" Catholic theologians would say that if a person made a sincere confession of their sins to God, they would be forgiven, with or without a priest, although their souls may be purified in purgatory before entering heaven. As to the original subject of this thread, perhaps the Anima Sola is atoning for her sins by helping those on Earth. I really don't feel the need to work with this particular spirit, but the discussion has been interesting. I believe (and if I'm wrong someone please correct me) the Roman Catholic Doxology is also the Glory Be, which is: Glory be to the Father, and to the Son, and to the Holy Spirit: as it was in the beginning, is now, and will be for ever. Amen. It's not 5 Doxologies but one said 5 times. I would like to hear from someone who has actually worked with this spirit and can tell me what they used it for, how it worked out, etc. For some reason, I find Anima Sola very intriquing. A friend of mine worked on this candle. She said that she used it for a couple months. It made her feel lonely and depress and also the person she was trying to get back with. She did not know that she had to repay anima sola for her work. One night she was in her bedroom with the windows closed and her bedroom door open and all of a sudden her bedroom door closed and there was a black shadow in front of her. Wow.. that's what I wanted to hear.. I guess you need to pay Anima Sola or suffer the consequences. Sorry your friend was depressed and that the spell didn't work. The Anima Sola picture we see so often is a detail from a well-known painting of the vision of Our lady of Mount Carmel who releases souls from Purgatory on Saturday if they died wearing a brown scapular. The belief in Purgatory, the veneration of Our lady of Mount Carmel, the wearing of the brown scapular for early release from Purgatory under the hands of Our lady of Mount Carmel, and thus belief in the Anima Sola are wide-spread in Catholic folk religion, but, as with all religious beliefs, you would do best to learn the tradition directly from a pracitioner of the Catholic religion and not through an internet forum dealing with folk magic. In other words, working with the Anima Sola is not a form of "spell-craft," but rather part and parcel of a much larger religio-magical structure, called the Roman Catholic religion, and you can't just go in and pick-and-choose some piece of that religion without understanding it. I have a question about the brown scapular... do you have to wear it at the moment of your death or can you request to be buried in it? lucky7clover wrote: I have a question about the brown scapular... do you have to wear it at the moment of your death or can you request to be buried in it? You have to be wearing it when you die. Where can I get one of those brown scapular? I believe LuckyMojo sells them. By Roman Catholic tradition, one needs to be formally invested with the brown scapular by a priest, and to gain it's benefits (release from purgatory) you have to adhere to the requirements of the Carmelite Order. The brown scapular is symbolic of the vestments that a member of the holy order would wear, and so to properly wear the brown scapular you must basically join the Carmelite order in a lay capacity. Receiving it's benefits requires saying certain prayers on certain days for certain reasons, and living by a particular ethical-code/ideal. Just wearing one without partaking in the formal requirements will not, officially, confer any benefit. Other scapulars, such as the green scapular, CAN provide its benefits to anyone, as long as the scapular is blessed by a priest, and someone says a short prayer on behalf of the wearer each day (you can say the prayer for yourself). I think the green scapular prayer is "Dear Immaculate Heart of Mary, Pray for Me (or name of the wearer you are praying for) Now and At The Hour of My Death". 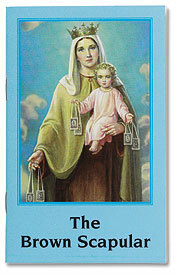 The green scapular is known for providing miracle healings, among other things. Someone with more experience with Catholic traditions may have more to add. I had made another post where i wrote that i had some jewelry stolen from me from an ex boyfriend. This was over a period of time and didn't actually notice anything was missing until after it was over. I went to the police and filed a police report. They said that i can go to the different pawn shops and the police will hold the items until we can prove that the jewelry is ours. However, thats the problem... some of the pieces were very old and i didn't wear often. I don't have any good pictures of the items. Someone on here has mentioned working with Anima Sola, perhaps she can guilt my ex into admitting to it all. And that she is very good at returning stolen items. However, the same person wrote that if she is not properly served, I could lose my job or residency. So, i would like to know what i need to do exactly in order to work with her and to also know what she needs in return. Pray to her and offer her something, for example you can offer her candle light for a number of days. She will only hurt you if you don't pay up and fail to keep your part of the arrangement. Theres also saint Anthony and Saint Aparicio, they both bring back what has been lost. I recently purchased a novena candle of the anima sola as well as a print image. Using the candle, how would someone curse their enemies using the Anima Sola? Anima Sola and the Intranquil Spirit? Are the Anima Sola and the Intranquil Spirit the same being? They sound extremely similar, both being a soul trapped in Purgatory and commonly used for less than ethical work. Re: Anima Sola and the Intranquil Spirit? Nope, totally different entities. 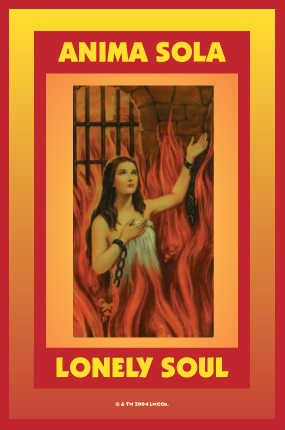 The Anima Sola (lonely soul) is about to be released from purgatory, not "trapped." Look at the picture! Anima Sola and bipolar disorder? 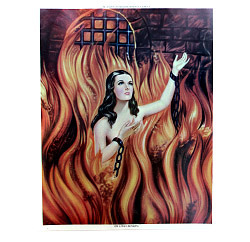 I have an intense affinity for the image of the Anima Sola, not only because I was brought up Catholic but because my own struggle with bipolar disorder reminds me of her suffering. I was thinking about praying to her, carrying a prayer card of her, or wearing her conjure oil as a way to protect my own mental state, but reading this forum and hearing about the traditional appeals made to her (and how she demands payment) I'm thinking maybe that's not such a good idea. Is it appropriate to appeal to her in this way,as a protector against mental torment? Or is this a formidable spirit that, as a new practitioner of hoodoo, that I shouldn't engage with just yet? In Catholicism, the so-called ‘anima sola’ is merely representative of ALL the Holy Souls in Purgatory. They are also sometimes called Poor Souls, due to the fact that they are in Purgatory and not yet with God in Heaven—something very much to be pitied. Purgatory, in Catholicism, is the place a soul goes to receive final purification of its sins so that it can be in the Presence of God. Only perfect beings can be in that Presence. The souls in Purgatory cannot pray for themselves any longer or do anything on their own in order to shorten their time in Purgatory, and therefore they rely on loved ones and other charitable people still on earth to pray for them and help them to be released from Purgatory sooner rather than later. It is believed that the Holy Souls are so grateful for the assistance of the living and their prayers, that the Souls in return will pray for their benefactors and intercede with God on their behalf, especially after they had completed their time in Purgatory and are now in the Divine Presence. There is no ‘payment’ due for their intercession, though it is traditional to have Masses offered for the Holy Souls in thanksgiving for prayers answered through their intercession, and they do not ‘get back’ at anyone who may renege on any promises they made to the Holy Souls. As to the role of the Brown Scapular, one MUST be enrolled in the Confraternity of the Brown Scapular in order to enjoy its benefits. It is a very short and simple ceremony, but it must be done by a priest. The scapular itself DOES represent part of the religious habit of the Carmelite Order. The only requirement of the wearer after enrollment, though, is basically to lead a good life in accordance with the tenets of the Roman Catholic Church—ie, go to Mass every week, go to confession regularly, stop sinning, etc. In addition, devotees are also asked to pray either a rosary every day or pray the Little Office of the Blessed Virgin Mary every day. That’s the minimum. You are technically NOT joining the Carmelite Order when you enroll in the Confraternity—there is a Third Order of Carmelites for laypeople, and that is MUCH more involved than enrolling to wear the scapular. There is also a medal version of the scapular that can be worn in place of the wool scapular, and many people choose that option after the initial enrollment (which is always done using the wool scapular). There are those, however, who believe that the medal is not an option and that you MUST wear only the wool scapular, but it was formally permitted to wear the medal by Pope Pius X (I believe). As for the ‘Brown Scapular Promise’—that whoever has been properly enrolled in the Confraternity of the Brown Scapular, and is wearing said scapular AT THE TIME OF DEATH will be released from Purgatory by the Blessed Virgin on the first Saturday after death -- Scholars have stated that the 14th-15th century document that originally made this promise is in reality false and that no such promise exists. Most Catholics who wear the scapular, however, reject that claim and still believe that it IS true. Probably because it just sounds so much like something that the Blessed Virgin would do! Anyway, I hope this helps clear up some of the confusion over the Holy Souls and the Brown Scapular. Remember that this is strictly from the Roman Catholic perspective, not hoodoo. I'm sure a lot of people will disagree with some of what I've posted. If anyone has any questions, just ask, and I’ll do my best to answer them. I am not a Catholic, but it is my understanding that any spiritual image from your religion which attracts you opens a valid path to follow. You should consult with others of your religion and folk-magical culture for best details on how to proceed. Wren, that was interesting. Thank you! You write from a strictly orthodox doctrinal point of view, but, of course, in this forum we are speaking of FOLK-CATHOLIC and FOLK-MAGICAL beliefs. It is all well and good to state that according to current Catholic Church doctrine these beliefs and customs are false -- and it is interesting that they are considered so -- but our mission here is to serve folk-magical and folk-religious practitioners, not the Holy See. Folk-religions and orthodox religions co-exist side-by-side and they may have different truths to tell. Therefore, while from an orthodox perspective you may think that people in this forum are in a state of "confusion," they are actually reporting on what they have been told by practitioners, or seen in practice in their own cultures. The employment of Intranquil Spirits and Purgatory Spirits of the dead who wander between heaven and Hell to torment wrong-doers is pretty common in Mexico. See also the Mexican spirit of La Llorona. Check out La Santisima Muerte, often described by Mexicans as "The Virgin Mary's sister." Cultural beliefs in thee haunting and haunted spirits of he dead pre-date the introduction of Catholicism into Mexico. Check out the Saint Martha thread if you really want to blow your mind! I understand what you're saying, Cat, hence my disclaimer at the end stating that what I posted was what the RC church teaches about it, and that it was not from a hoodoo perspective. If I agreed 100% with everything the RC teaches, I wouldn't even be posting here! I just thought that it might be interesting/informative for others to know this info and I didn't mean to imply that anyone else's beliefs are wrong. I apologize if I've offended anyone! I am seriously thinking about working with Anima Sola. I know that working with the Intranquil Spirit is considered dangerous; am I correct in saying that while Anima Sola is considered an advanced spirit that working with her is not dangerous? I've worked with anima sola so I am hoping I can answer your questions. I don't know that working with anima sola is dangerous so much as advanced as other forum members have attested--at least, no more dangerous than working with any other spirit. Having worked with her, I can attest that it is particularly important to keep cleansed and protected. This should always be emphasized anyway but the energy, while potent, *is* lonely and that can be particularly challenging while working on reconciliation cases. I do not recommend working with anima sola if you are inclined towards depression. I certainly wouldn't recommend working with anima sola if you don't have a great deal of experience with spirit work especially as there are other spirits that can be called on to do similar things. Regardless, I recommend you do as much research as possible, including reading this entire thread, before you make any firm decisions. It would also be very wise to consult an AIRR member if you are unsure and if it would be indicated in your case. I have just had some Anima Sola work completed, which is aimed at bringing a girl back to me with their help. Can I ask, for those that have worked with these spirits and have knowledge of them, how long do they usually take to work? Obviously this is not an exact science, but I'd imagine that as they are souls in purgatory that are desperate to be released, they will strive to work fast to complete the task they have been set. I would be grateful for anyone's opinion on this, as the Anima Sola spirits fascinate me somewhat. Many thanks for your insights! duchess has given you excellent advice! This spell can takes days to months. I've seen people say that it worked immediately and others say it took a long time. Some say it didn't work at all. There's no clear answer (as you had already stated). Also, I am sorry but I have edited your post because there were too many questions and the moderators would not answer that many. Your best bet is to do research yourself and not to use the forum for this venue. I just wanted to know if the prayer for Anima Sola was the only one you can give or if you can pray from the heart? The Intranquil Spirit is from Hell. 1) Is the Anima Sola more powerful than the Intranquil spirit? or vice versa? I mean in terms of affecting the target the strongest and for quicker results? 2) I don't think i've ever read of anyone conjuring both at the same time but if it ever did happen, would they both work together -- or would they cancel one another out? 1) Who is more powerful, The Hulk or The Thing? 2) If they both appeared in the same issue of Marvel Team-Up, would they work together or would they fight one another? Thank you for contributing this information—I'm sure many people will find it helpful! I just ordered a Anima Sola candle from the Missionary Independent Church, candle ministry. I needed her help to harm my enemy. What will I need to do to pay her back for helping me? Sister Jean, I will leave her a glass of water with ice one of the commenters above me mentioned. Although I petitioned for The Anima Sola to aid me in harming my enemy. It appears she is really for loved ones who have passed away. But her candle describes use for both. I am confused as to why it is said whoever works with Anima Sola ends up alone.....then how is she used to bring back lost lovers? If the lover is back then how are you alone? Please know I dont ask questions to argue- not at all....I ask to be educated so i dont do incorrect, dangerous, or disrespectful things. The confusion arises because an orthodox Catholic image of the Anima Sola has been adapted for use in the heterodox folk Catholic practices of Latin America. Someone please help me, I've had an Anima Sola sent to me by an ex. I am no wrong doer, I adored this man but he said he didn't want me so I moved on. It has been feeding on me for years, everything from extreme destitution to eviction to countless abusive partners and humiliations and betrayals. I did date him again for a short time during this, he played the same game, and I always had the weird sinking feeling I wasn't allowed to move on from him but he could do whatever he pleased. I have a very reputable professional with friend who honed in on this spirit, and said that he wanted red wine and had committed suicide in life due to unrequited love. I gave an offering and have burnt two St Marten candles praying for his soul to cross over, or go back to my ex as I tried making him identify with me that o have also been very tortured in this life and that he should go torment the thoughtless rich boy who had him delivered to me. We have done countless workings but he's not budging. I am currently in a relationship with someone who I deem my life partner, and yes it is equal on both sides. However, our beginning was turbulent but we made it. Our fighting made no sense because we were best friends for ten years. We are doing excellent now, and I believe him to be my twin flame, as I find when we were platonic, our bond has been too strong to be broken by this thing. However, I moved in with him and we have both heard him talking to us when we are sleeping in bed, but not with each other but alone consecutively. Just the other week when I was laying down basking in the glow of a romantic day out, he said to me "there is little happiness'. The love of my partner is the only thing working out for me, but it effects him too and I don't want him to see me suffer anymore and continue to be let down as things keep inexplicably fall through for me. To impose on my favorite person this way has been the worst. I pray every day and I meditate, and nothing is breaking. Please help me someone. Please. Thank you for reaching out to us through the Lucky Mojo Forum, but i feel that since you already have a professional worker on your case, have made offerings, and have prayed for the release of the spirit, you either need to trust your worker or you need to find a different worker. We do carry that holy card, if you want or need one. We make and sell hand-made spiritual supplies which are widely employed by mediums, root doctors, and conjures, but we cannot do the work for you.